The chapters “Encrypting Security Header Elements” and “Using Derived Key Tokens for Encryption and Signing” describe how to encrypt security header elements as well as other ways to encrypt the SOAP body. 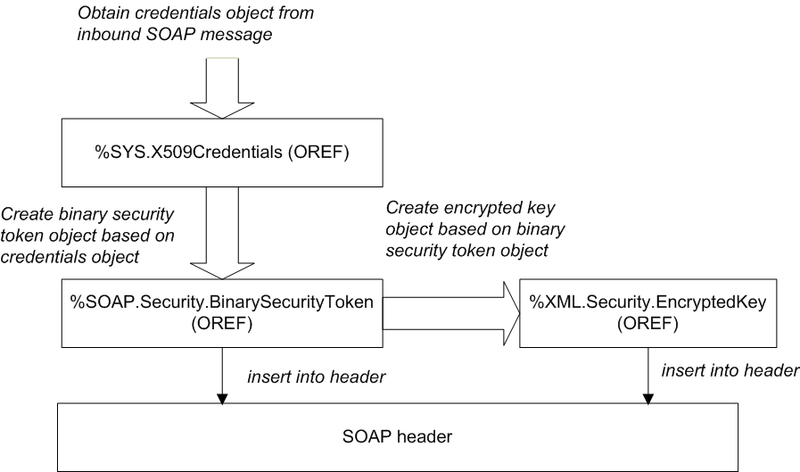 Obtain a credential set that contains the public key of the entity that will receive the SOAP messages, typically from the inbound message that you have received. See “Retrieving Credential Sets Programmatically,” earlier in this book. Optionally modify the encrypted key instance to use different algorithms. See “Specifying the Block Encryption Algorithm” and “Specifying the Key Transport Algorithm,” later in this chapter. See the general comments in “Adding Security Header Elements,” earlier in this book.